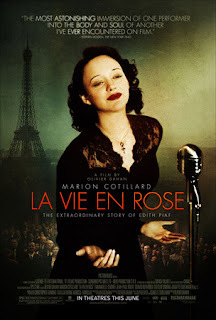 La Vie en Rose may be the song in which La Môme was entitled in its american version, nevertheless, it’s another song that comes out as the heart and soul of this film: Non, je ne regrette rien. The lyrics truly punctuates what was the passionate life of the french performer Edith Piaf, going from her poor childhood, the glory of fame and public recognition until her death at the age of 47, when she resembled a 70-year old woman. Her life, starting from her early years would give enough material for a Charles Dickens story tale. I haven’t read any biography of Piaf before i watched this film, but for the little i know, it seems like no movie or any other fictional piece could ever get close from the real drama of her life, so let’s cut the crap from here: please, don’t lower this movie for the simple fact it is an overdramatic endless act. Because, yes, it actually is, but it couldn’t be different. Who knows if in the hands of another filmmaker the result would turn differently, but i’m pretty satisfied with the direction Olivier Dahan chose for telling Piaf’s life story. I confess i resisted in the beggining due to the rough editing of the film, ping-ponging among her past, her ending, her betweens. Is it really so hard to comprehend what this woman was? I believe Dahan yearns for originality by choosing this uncommon storytelling style, as i hardly recall so many unexpected time and space fluctuations in other similar movie biographies. The film begins with Edith collapsing on stage and quickly jumps to Edith, the child; whose mother sang on the streets to earn her living while Edith’s father, a circus acrobat was away. Then, we’re suddenly sitting on a table along with Edith after she had accomplished all the success she ever dreamt of. The child hardly says a word whereas the famous singer can’t avoid shutting her mouth for a second in the presence of others, but the mythical woman simply does what she does best: she passionately sings. And as she sings, her entire audience devotes their senses on hearing her voice. If the editing seems confusing in the beggining, while making several connections in Piaf’s life, the camera moves freely and quickly, perhaps a visual trick or even a metaphor for the turbulent life Piaf had. Whenever bothered me in this film didn’t matter after all, thanks to the terrific performance of actress Marion Cotillard: She’s Piaf. And how her dramatic and convincing transformation reminded me of another breathtaking performance, the one from Judy Davis as Judy Garland (perhaps the american equivalent of Piaf) for television. It almost feels like if Piaf in spirit was back to life in the body of the beautiful french actress. It was clearly not only the efficient make-up that helped her on the character’s composition. She totally gave herself to this role while acquiring different manners, a different voice and permanently arching her back to remind of us Piaf was a little woman in stature, but yet so great in her inside. I haven’t seen a better female performance this year so far. She’s worth of all the upcoming season awards. >Romeika, o trailer de "La Vie en Rose" já está passando nos cinemas daqui de Natal, o que me deixa muito esperançosa a respeito da estréia dele por essas bandas.Adorei o paralelo que você fez entre a Marion Cotillard e a Judy Davis. O engraçado é que toda vez que eu vejo algum clipe da Marion como Piaf, eu me lembro das duas Judys. Acho que a palavra correta seria que as duas meio que psicografaram as duas personas reais que interpretaram.A Cotillard, até agora, é a atriz mais comentada do ano. Li um artigo nessa semana que dizia que não existem adjetivos possíveis que possam descrever o que é a atuação dela.No mais, me corrija se eu estiver errada, mas a impressão que você me deu é a de que o filme em si não lhe entusiasmou, mas a atuação de Cotillard faz tudo valer a pena?Bom final de semana! >Adorei o post, não conecia muito sobre o filme e agora estou louca para ver! >Kamila, pegando emprestado um termo do espiritismo, essas duas realmente psicografaram as suas personagens. Atuações fenomenais. Sua impressão está certa, o filme, enfim, não me entusiasmou tanto, mas foi me conquistando aos poucos e isso se deve à Marion Cotillard. Não amei, mas gostei. No início fiquei incomodada com a edição do filme e o teor melodramático, mas já pelo meio percebi que não poderia ter sido de outra maneira.Amei mesmo foi a Cotillard. Estou torcendo por ela nas premiações! Bom sábado!Carolina, vale a pena. Assista quando estrear no Brasil. >Romeika, mas você não é a única a se sentir assim. A maioria das críticas que eu li fala justamente isso: que o Olivier Dahan fez um filme frágil, mas que se salva por causa da Marion Cotillard. Eu achava engraçado porque os críticos falavam um, dois parágrafos sobre o que o Dahan fez e depois desandavam a falar sobre a Cotillard. Ela monopoliza mesmo as atenções.Disse no meu primeiro comentário que eu tinha esperanças de que esse filme fosse estrear por aqui, mas, depois de minha ida ao Moviecom hoje, estou 50% menos esperançosa. Espero que o Cinemark nos salve! >looks and sounds(by your review) to be sooo good! >Coco and Modern Marie, it's worth it watching this film. Marion Cotillard has such a stunning performance in it.Kamila, então eu concordei com a maioria dos críticos dessa vez. Acho que se a atuação fosse ruim não teria acreditado no filme (que é bom). E tomara que essa estréia chegue a Natal! >Deus te ouça, Romeika, e que "La Vie en Rose" chegue em Natal. >Vinícius, sempre quis ver o filme pela atriz mais do que pela obra em si. A Marion Cotillard é a minha favorita absoluta ao Oscar e ao que mais vier pela frente ou antes. Não vi performance mais esplendorosa esse ano e duvido que outra chegue a genialidade dessa. Abs!